Demolition of Whiskey Priest & The Atlantic Beer Garden along Boston's waterfront has begun to make way for the upcoming St. Regis Residences. Once the bars have been cleared work will start on the 22 story tower that will hold 114 luxury residences. The project also calls for around 10,000 sf retail space and three levels of underground parking. Construction is expected to be complete in around 2 years. 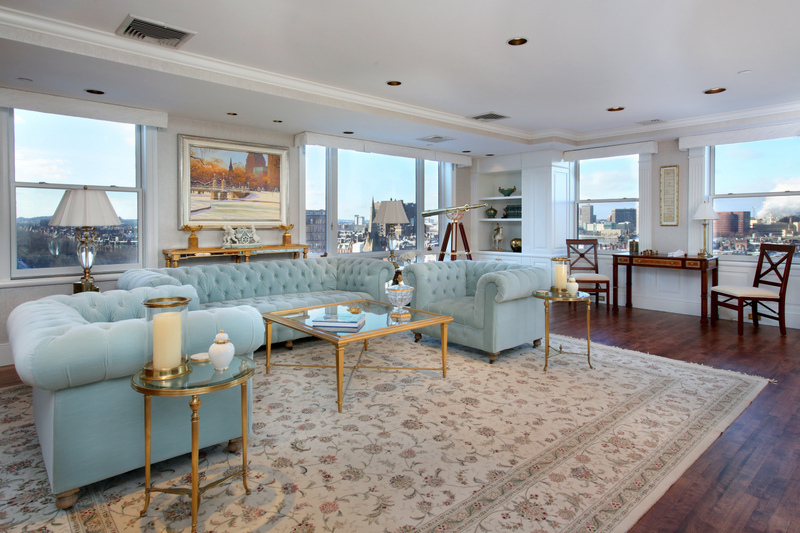 St. Regis Residences 150 Seaport Blvd. 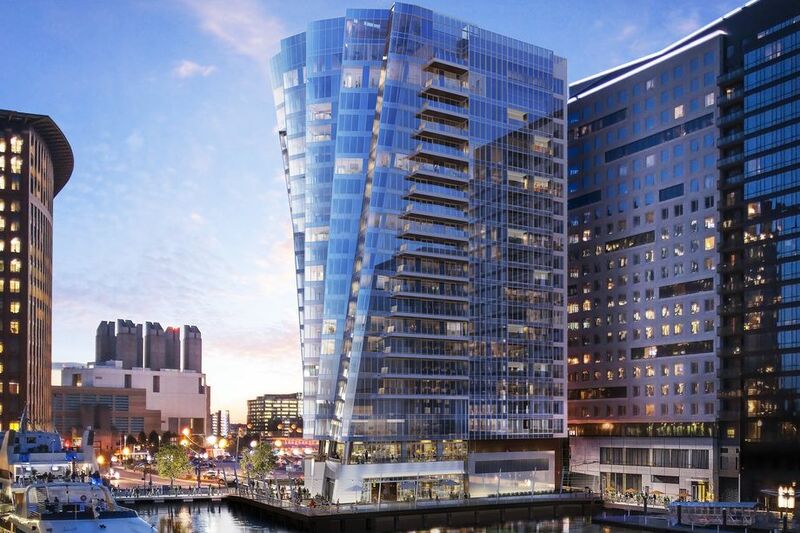 Seaport's 150 Seaport Boulevard to be the St. Regis Residences, Boston. Billowy 22-story tower will have 114 luxury condos. The famously billowy condo tower planned for 150 Seaport Boulevard, on the Seaport District sites of the Whiskey Priest and the Atlantic Beer Garden, will open as an outpost of the St. Regis luxury brand, according to developer Cronin Development. The firm reached a licensing deal with Marriott International, which is not itself involved in the development. The tower is due to have 114 condos and to reach to 22 stories. A groundbreaking is expected this fall, with an opening scheduled for late 2020. Such an opening will cap a long time of back-and-forth on the plans. The Conservation Law Foundation, an environmental group, agreed in January to drop a lawsuit against the project in exchange for $13.1 million in funding for a waterfront park, a public dock, and children’s programming. The group had opposed Cronin’s (very expensive) plans on zoning grounds because of concerns about public access to the waterfront. As it stands now, the future condos will come with access to a suite of St. Regis-branded luxury services, including concierge and butler service, and to amenities such as a swimming pool, a spa, a health club, a library, and what the developer is calling a golf-simulation room. Then there’s the design of the building itself, courtesy of the late Howard Elkus of Elkus Manfredi. It is meant to evoke a billowy sail. Stay tuned for sales (the other kind). Those are expected to launch in the fall. Boston's Neighborhoods: How They Got Their Names. Boston is named after the town of Boston in eastern England. 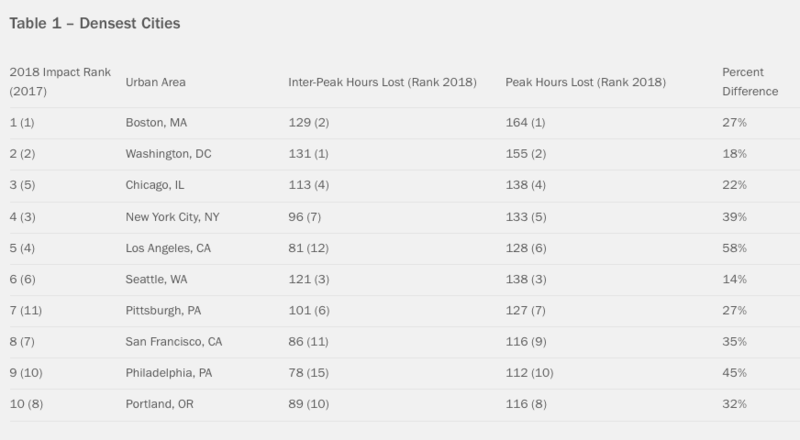 But what about the city’s neighborhoods? A lot of them have similar roots in old Albion, while a sizable chunk are tethered etymologically to geography. Read on for the origin stories of Boston’s 22 large neighborhoods. 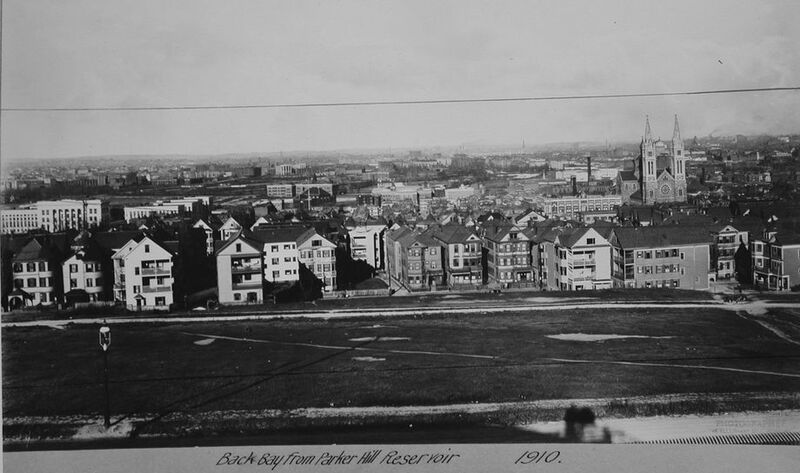 This neighborhood was for years simply the stockyards and rail yards of the town of Brighton. It also had a post office and quite a bit of woodlands. One gentlemen who liked to hike the woodlands was the painter Washington Allston, who lived across the Charles River in Cambridge. By the time Boston annexed the area in 1874, it was known by his surname. 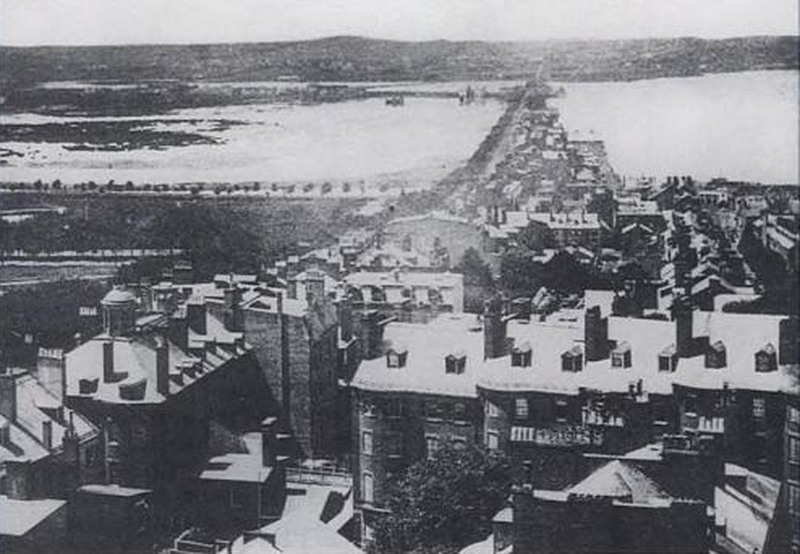 This photo from 1858 shows the Back Bay on the left and the Charles River on the right. Public domain. Multiple hills—some say three, some say five—comprised what became Beacon Hill, one of the first settled areas on the Shawmut Peninsula. One of those hills became known as Beacon Hill because of a signaling beacon on it; and the name stuck. The smallest neighborhood that the city itself breaks out, Bay Village was born in the 1820s as the collection of homes for the workers who built the tonier nearby Beacon Hill. Therefore the architecture looks similar. Bay Village used to go at various times by the Church Street District, South Cove, and Kerry Village. Bay Village stuck, perhaps given its immediate geographic proximity to the pre-infill Back Bay. Brighton was its own town until Boston annexed it in 1873. 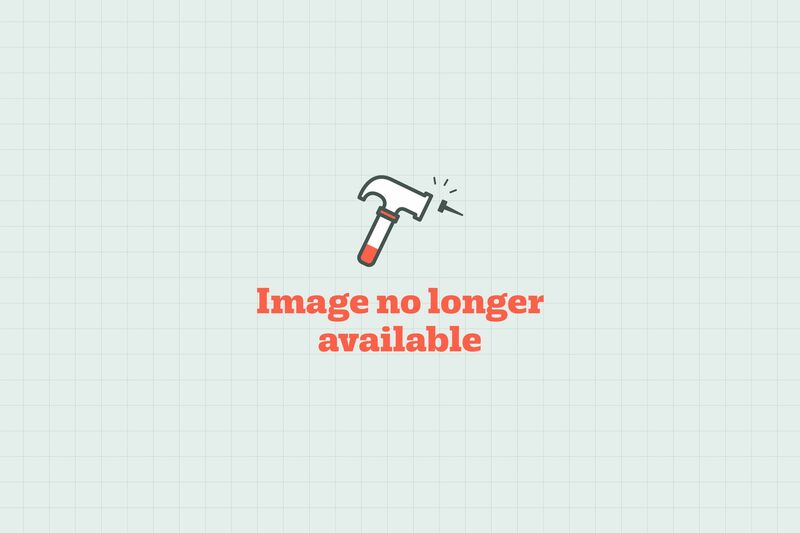 By that point, it had been independent for only about half a century; and, before that, was known, along with what became Allston, as an agricultural and cattle-rustling appendage of Cambridge that went by the diminutive nickname Little Cambridge. It changed its name to Brighton, after a town in southern England, upon independence in 1807. Charlestown was named for—wait for it—an English king named Charles; in this case, Charles I, the Stuart on the losing end of the English Civil War. Europeans began settling what became Charlestown in 1629—20 years before Charles I lost his head—and it remained an independent municipality until 1874, when Boston annexed it. This neighborhood is named after its predominant ethnic group; though rising housing costs and other reasons for emigration have reduced the number of residents of Chinese descent. Boston’s largest neighborhood by area is named for Dorchester, a town in southern England. Dorchester, USA, was an independent town until 1870, when Boston gobbled it. As a town, it included parts of what became known as South Boston. 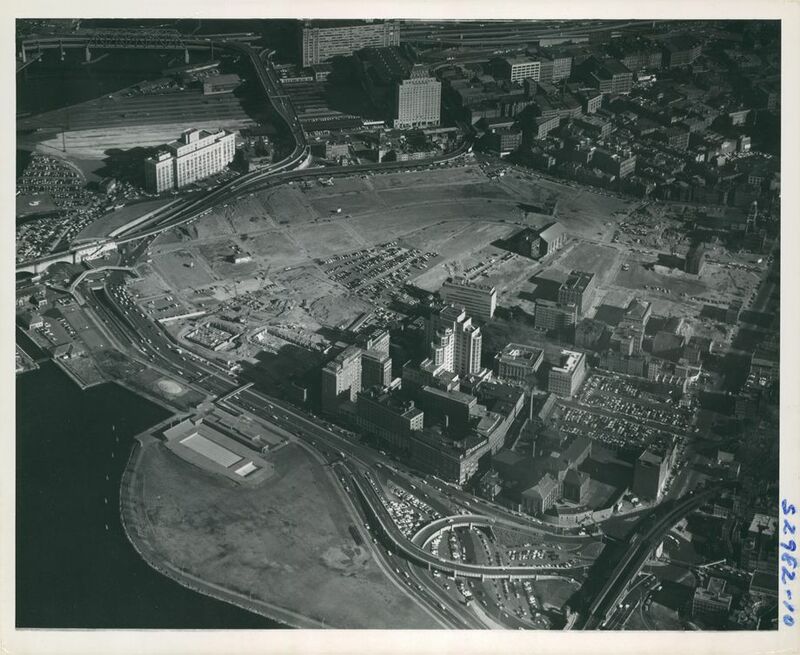 The infill-spurred linkage over 150 years of five islands east of Boston formed this neighborhood. And the “east of Boston” bit gave it its name. 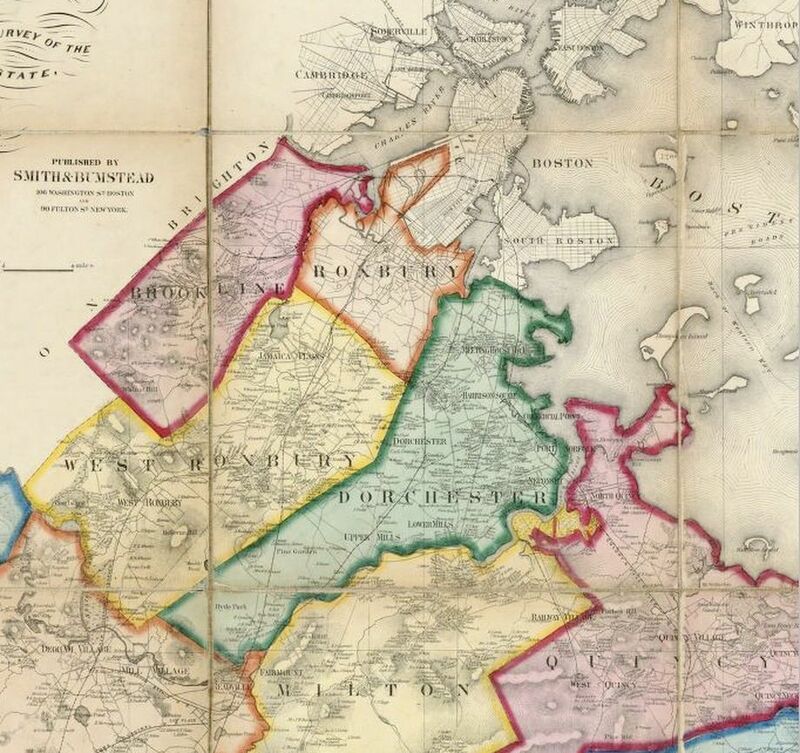 The neighborhood’s private developers saw to its annexation to Boston in 1836. 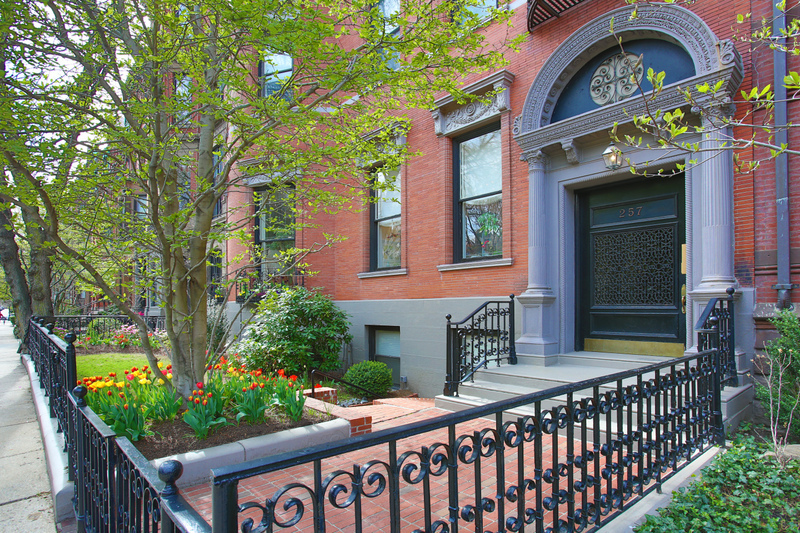 Take your pick: This neighborhood’s name came either from the Back Bay Fens, a park that landscape architect extraordinaire Frederick Law Olmsted designed, or from a road that ran along it. Fens, incidentally, is a term to describe a marshy or flood-prone area, which this eventual neighborhood was. Boston annexed Fenway and its Kenmore Square and Audubon Circle areas from Brookline in the 1870s. It’s sometimes called “the Fenway”—often an unconscious nod to the theory that the neighborhood was named for the road. 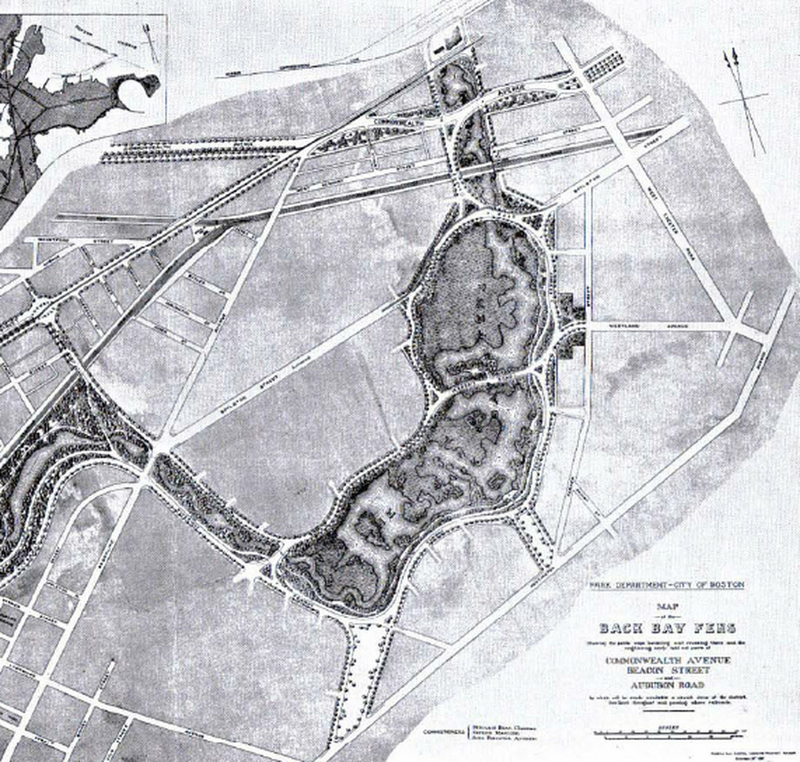 Boston’s southernmost neighborhood—and the last to be added through annexation, in 1912—is named after the park in London dating from the 1630s. This is another tossup in terms of origin. JP was either named after the Caribbean island from which some residents drew their wealth via the slave-driven rum and sugar trades; or after the Anglicization of the name of a Native American leader. Or! As in the case of Jamaica in Queens, New York, it comes from the name of a Native American tribe called the Jameco. JP became part of Boston in 1874. Interestingly, it was part of the town of Roxbury and parts of Jamaica Plain became the town of West Roxbury. This small neighborhood’s name is a vestige of its original function starting in the late 19th century: Yup, it was where leather was manufactured and where people shopped for it. The name comes from the Neponset Native American phrase meaning “a good place to be” or “a good place to sit.” Boston thought so: It annexed Mattapan in 1870. This small neighborhood’s name evolved from Parker Hill—after the area’s salient geographic feature—to its present name after the 1870 opening of the Basilica and Shrine of Our Lady of Perpetual Help (a.k.a. the Mission Church). 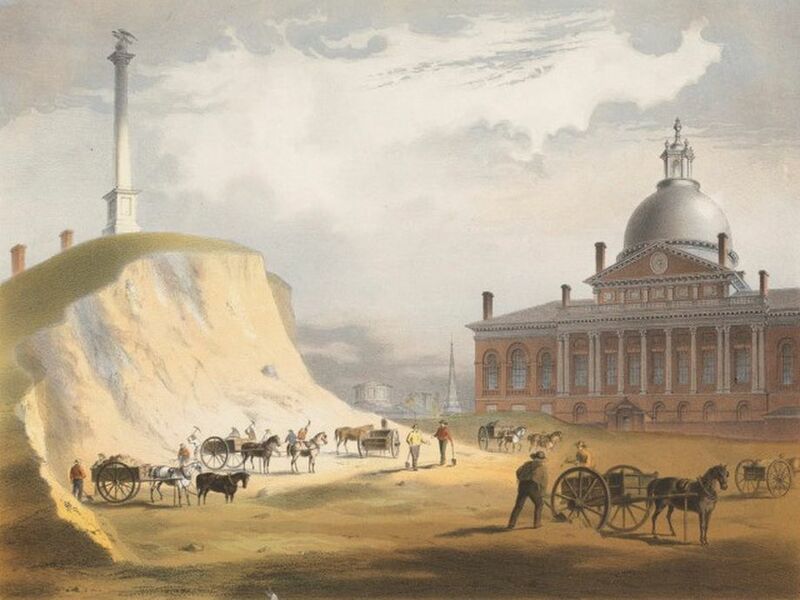 Mission Hill was once part of the town of Roxbury, and was subsumed into Boston in 1868. Until the geographic maturation of Charlestown and East Boston, this area was for a very, very long time Boston’s northeastern-most neighborhood. Hence the name. In 1870, the residents of what would soon become Boston’s newest neighborhood put their heads together to come up with a name acceptable to the U.S. postal service. The area had been known as South Street Crossing, after a railroad crossing, but that wouldn’t due if it were to host its own post office. A resident who had been there suggested naming the area after Roslin, a bucolic village outside of Edinburgh, Scotland. Boom. Done. 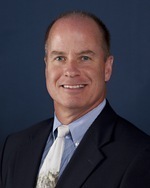 Roslindale had been a part of both the town of Roxbury and then the town of West Roxbury. Boston absorbed it in 1873. Roxbury was originally one of the first towns in the Massachusetts Bay Colony. Its name likely comes from what came to be called Roxbury puddingstone, which was once trip-over-it easy to find in the area (and which, incidentally, is Massachusetts’ official state rock). 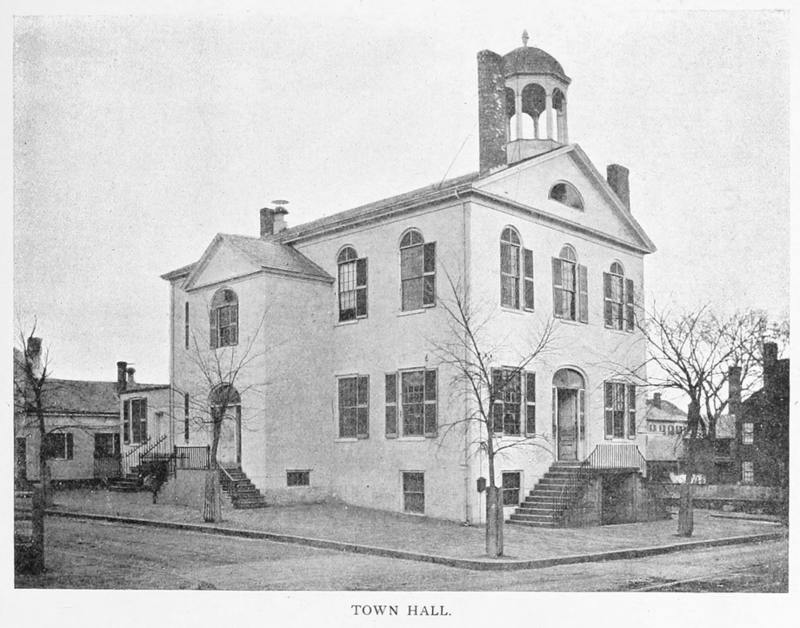 Parts of the town of Roxbury began breaking away from it in the mid-19th century, including West Roxbury and Jamaica Plain; and Boston annexed what was left in 1868. The neighborhood was so narrowly peninsular back in the day that European settlers called it the Dorchester Neck. 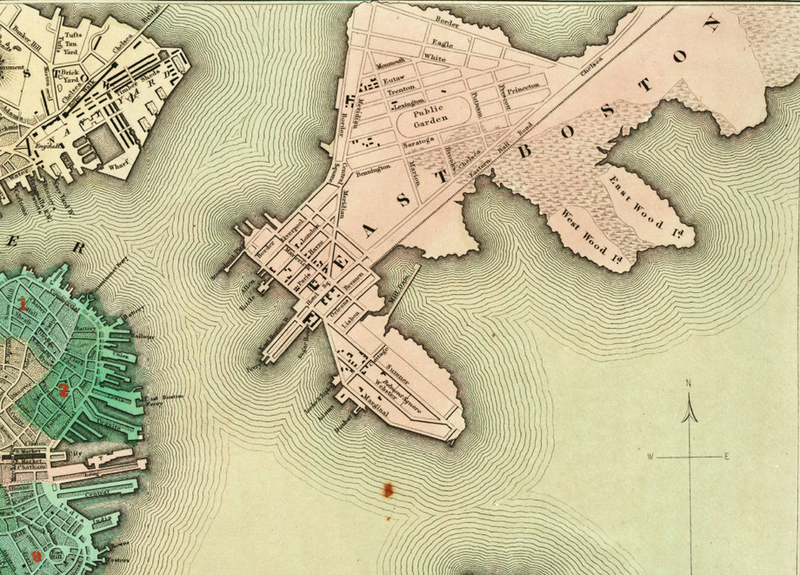 A wide inlet separated what became South Boston from Boston proper, which annexed it in 1804, and which eventually made it more accessible and much, much bigger through infills. In the mid-1800s, when officials and developers starting planning a neighborhood on what was then tidal flats, the area was the southernmost end of Boston. Before the annexations and the infills, this area was simply the westernmost point of Boston. A body of water, in fact, separated it from much of the city for a time. A so-called urban renewal effort in the late 1950s and early 1960s saw much of the West End razed and replaced with largely unwelcoming superblocks. The western reaches of the town of Roxbury seceded in 1851—viola West Roxbury. This newly independent town then threw its lot in with Boston in 1874.